The Vancouver Asian Film Festival Society (VAFF) is a not-for-profit organization that provides a forum for independent North American Asian filmmakers to showcase their work to both Asian and non-Asian audiences. The aim of VAFF is to foster an understanding and appreciation of today’s independent North American Asian filmmakers, while providing a springboard to larger film festivals. The society endeavours to represent the often ignored North American Asians caught between two cultures. The Vancouver Asian Film Festival Society will provide a cultural bridge between the Asian and non-Asian communities as well as the Asian communities themselves. The majority of screenings sell out fast and VAFF special events are very popular. Don’t miss out on your opportunities to mingle with filmmakers, actors, and other industry guests at VAFF. Get your tickets and passes early. SFU/Praxis Theatre in the Woodward’s Building at 149 W. Hastings screening films on Saturday Nov. 6 only. Go green and walk or bike to the theatres. You can also get to the theatres by Skytrain (Stadium Station) or bus. There is also underground pay parking at the Tinseltown complex (enter off Abbott St.). Many filmmakers and cast members will be available to answer questions after the show. Stay in your seats for an intimate discussion. Mingle with them at the VAFF After-Parties! 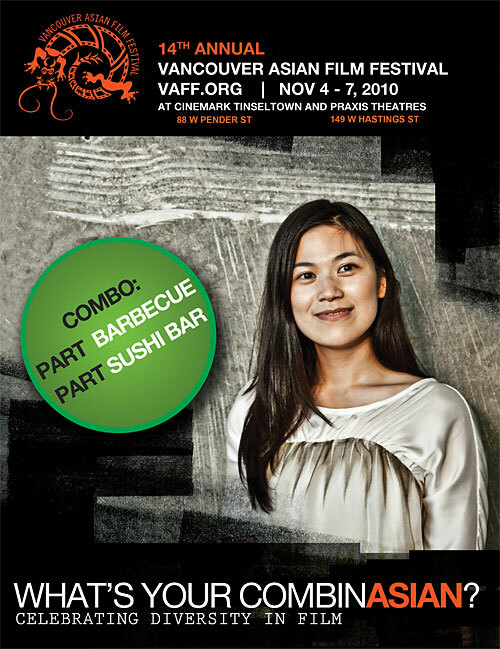 Note: VAFF Membership fee ($2) NOT included in any ticket or pass prices. Get the VAFF VIP treatment! Receive complimentary priority access to all film screenings and special events at the Festival. Mingle with filmmakers, actors, and other industry guests. You save money too! Check online for event info and updates. Get your VAFF VIP Pass early to avoid disappointment. Kick off the 2010 Vancouver Asian Film Festival with the Canadian Premiere of director Sona Jain’s award-winning feature film FOR REAL. Mix and mingle afterwards with visiting filmmakers, celebrities, writers and local personalities. Gala Reception | Kentizen Fusion Lounge @ Tinseltown, 2nd Floor, 88 W. Pender St. Following the Centrepiece screening of Academy Award winning filmmaker Freida Lee Mock’s latest documentary SING CHINA! come and celebrate at the beautiful and chic The Keefer Bar in the heart of revitalized Chinatown, a place where you can escape the rush and unwind in a unique atmosphere where cocktails, food and music are in harmony. The National Film Board of Canada (NFB) will announce the annual award for the Best Canadian Short at this private luncheon for filmmakers, industry, media and special VAFF guests. Wrap this year’s VAFF with Closing Night director Jeff Chiba Stearns at the swanky see-and-be-seen OPUS Bar, the perfect backdrop for Vancouver’s style savvy crowd. Unwind and chill with the VAFF Execs and Volunteers as we all take a much needed break.